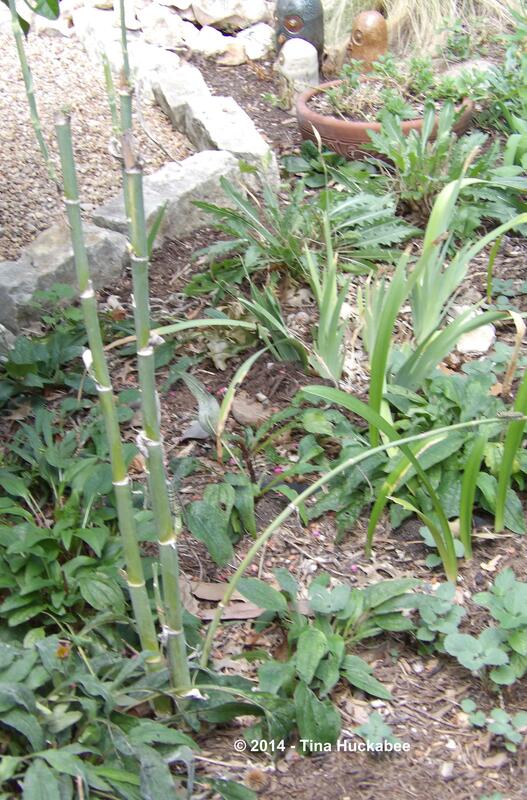 This is one of my fennel plants. 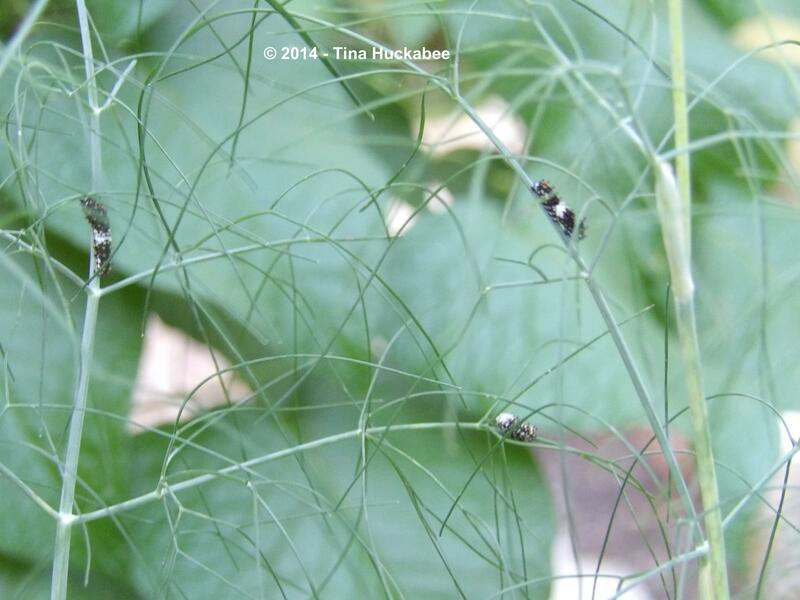 These are the cause of why my fennel plant looks like it looks. Actually, they’re all the same caterpillars. 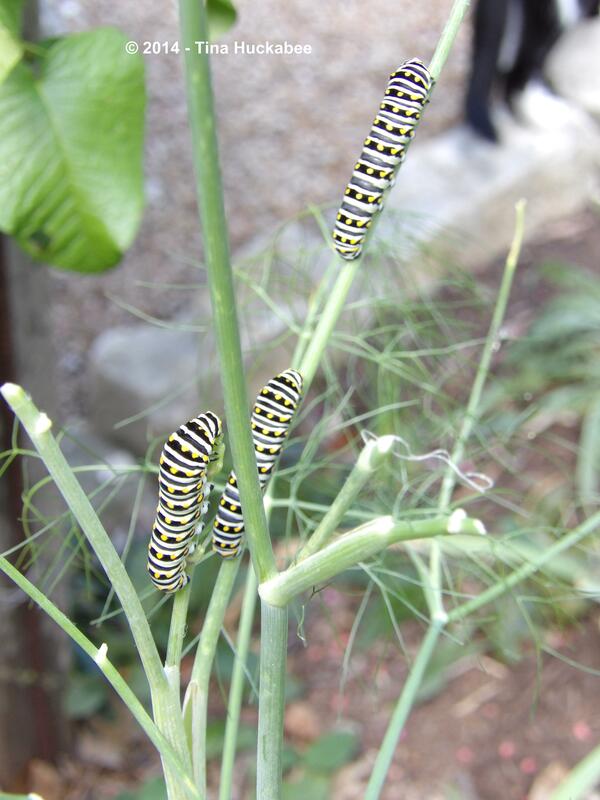 They ate fennel and they grew; caterpillars are like that. 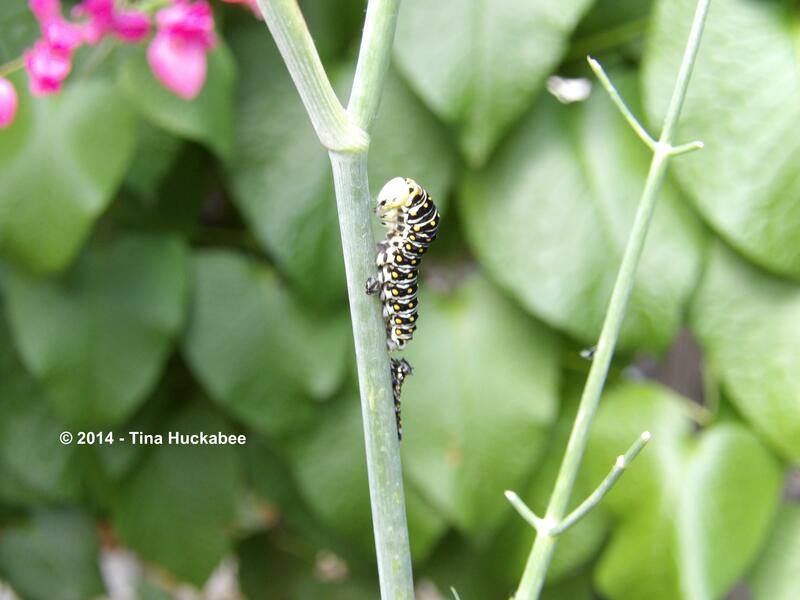 There were ten Black Swallowtail, Papilio polyxenes, butterfly larvae dining on this fennel over the past week or so. 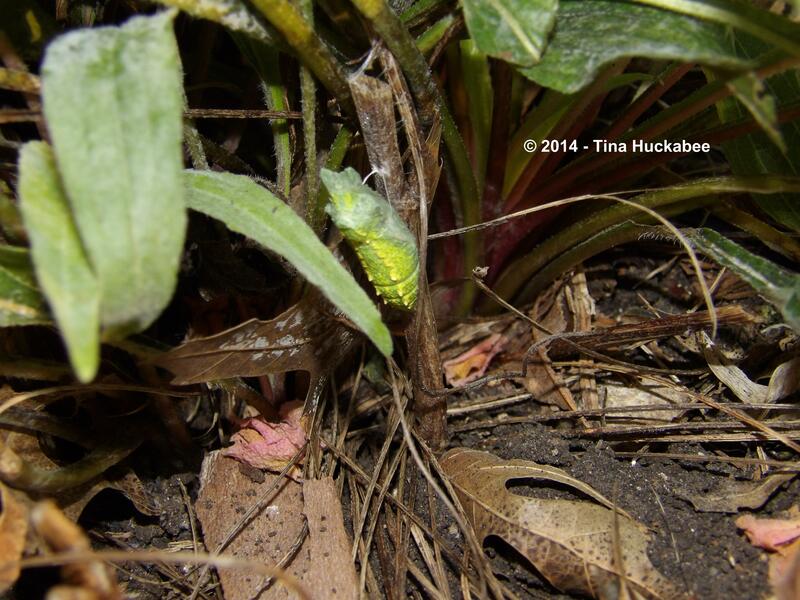 …because from all those caterpillars, this is the only chrysalis that I’ve found. I’m sure the others are nearby, safe from munching predators. I’ll keep an open eye for the emerging butterflies during this next week. 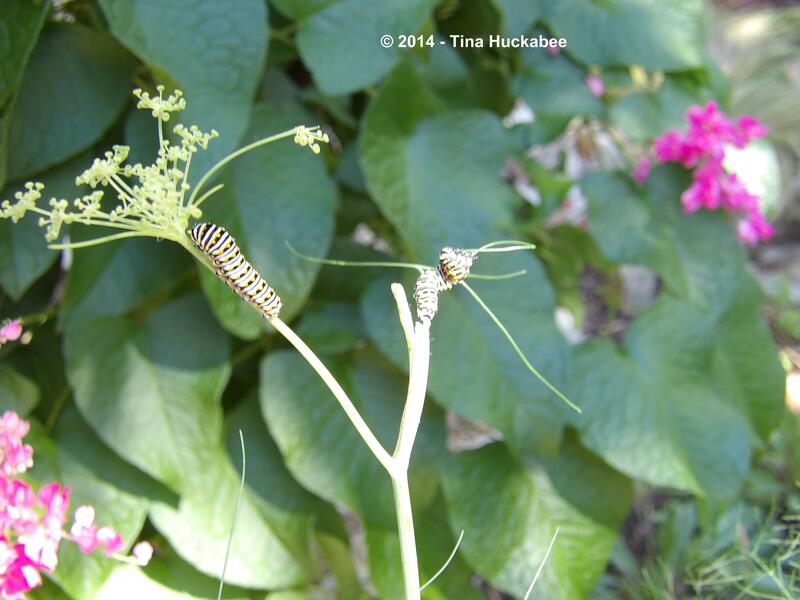 This entry was posted in Black Swallowtail Butterfy, Black Swallowtail Caterpillar, Fennel, Papilio polyxenes, Uncategorized and tagged Black Swallowtail Butterfly, Black Swallowtail Caterpillar, Fennel, Papilio polyxenes by Tina. Bookmark the permalink. Swallowtails! They are the most astonishingly fashionable caterpillars don’t you think? Those patterns and that use of contrasting colors! Momma Nature ever gets on Project Runway all the other designers might as well stand down. My fennel was looking so awful towards the end of the summer that I went ahead and chopped it off to promote new growth with fingers crossed it was only the heat and lack of rain causing it to struggle so. It has come back a little but I bought another plant recently to supplement and am torn between planting it where the fennel has “always been” here or trying it out in a new spot. I guess I don’t know the natural life span of fennel. Maybe I simply need to buy several more? PS: I have such coneflower envy. So many healthy rosettes! That particular fennel is well over a year old–it’s very happy there, though it hasn’t looked its best for a while–that happens with butterfly plants and I tolerate it. The others I grow are planted in an entirely different area, get full sun and they do struggle a bit. I just planted 2 more fennels and a dill beside this one. The dill came with two caterpillars, so it’s happening again! Coneflowers are like weeds for me. I’ve had a few sprout up new blooms for fall, but most are happily settling in for winter dormancy. Yesterday I kept seeing all kinds of black swallowtails fluttering around the cemetery. They were probably looking for your garden and those adorable owls. Ha! Well, maybe for the garden, probably not for the owls! Nice shots of the caterpillars throughout their life cycle! 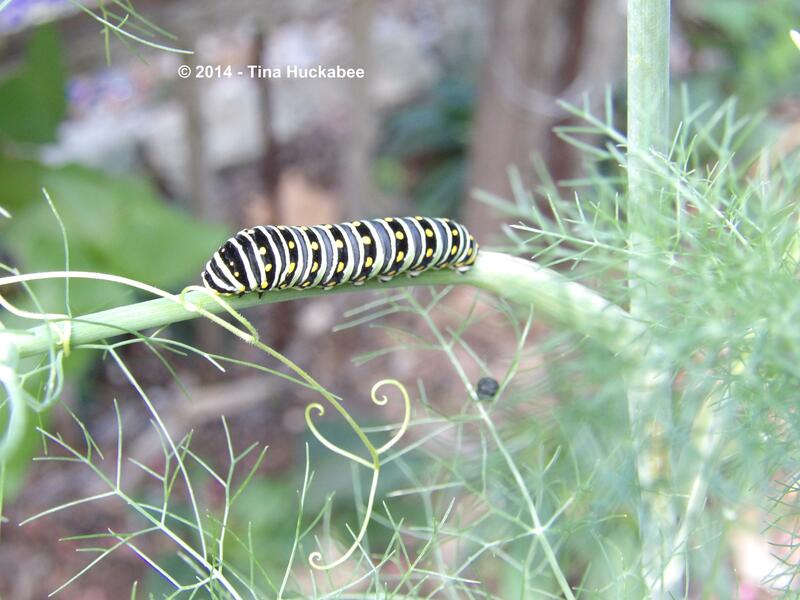 We had a very reliable fennel plant that attracted three rounds of Swallowtails, but it died last winter and i just replaced it and bought a dill plant in September. No caterpillars yet, but I hope to see some this coming spring. 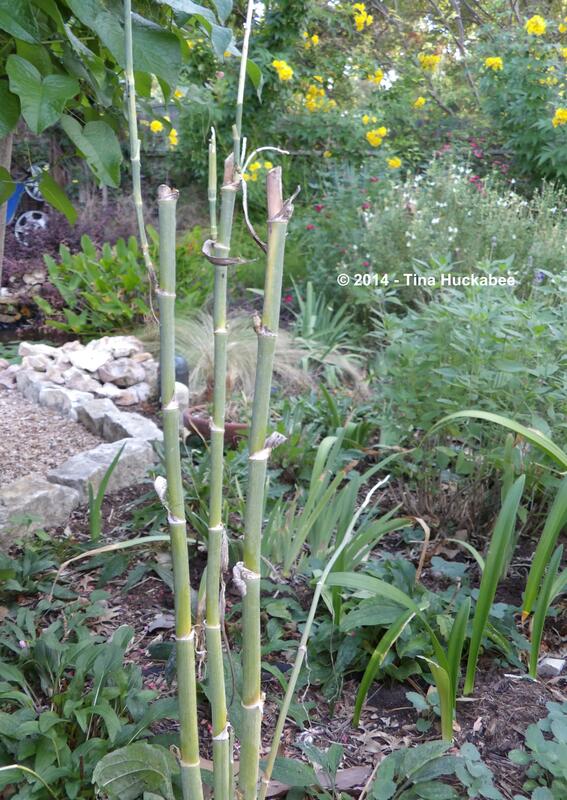 Fennel is even pretty attractive in its defoliated state in your yard. Fennel is an annual for me. 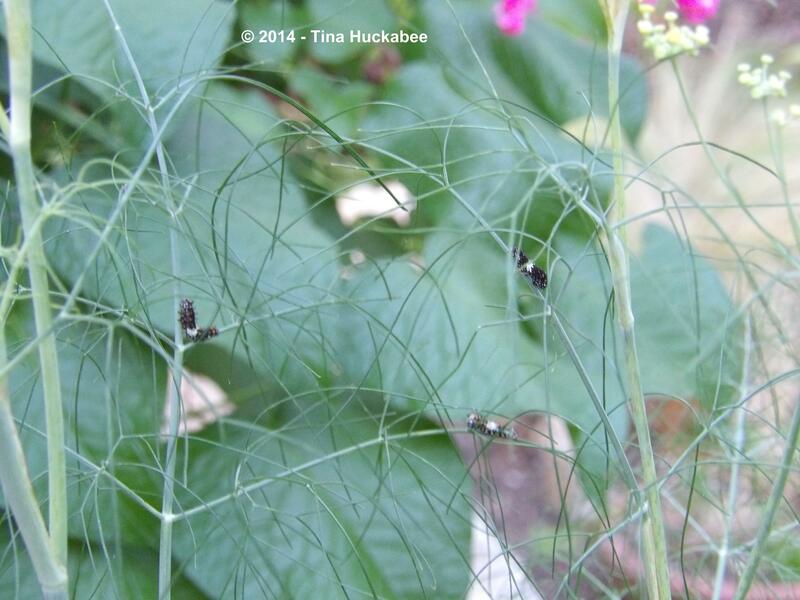 This particular fennel has live longer–I think it’s just in such a good spot. Your fennel will be pretty this winter-it’s a nice evergreen and I’m certain you’ll get your caterpillars-so fun to watch. 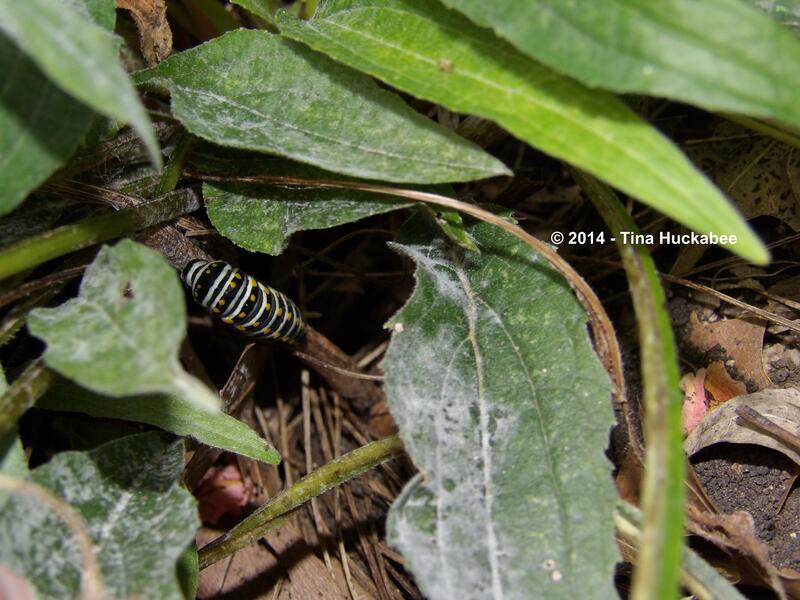 Ten swallowtail caterpillars? Impressive! I had three on my parsley a week or two ago. I just released my Monarchs that I reared from cats, and with a vacancy in my butterfly condo, I thought I’d give a go at rearing the one swallowtail that remained on my parsley. With the disappearance of about 75% of my Monarch caterpillars when they were living in the garden (I’m quite sure birds are the culprit), I decided to bring the last swallowtail into a safer environment. I’m hoping I have as much success as I did with my Monarchs! Hopefully your caterpillars found good hiding places for their metamorphosis and didn’t meet the same fate as my garden-reared Monarchs. It was something! 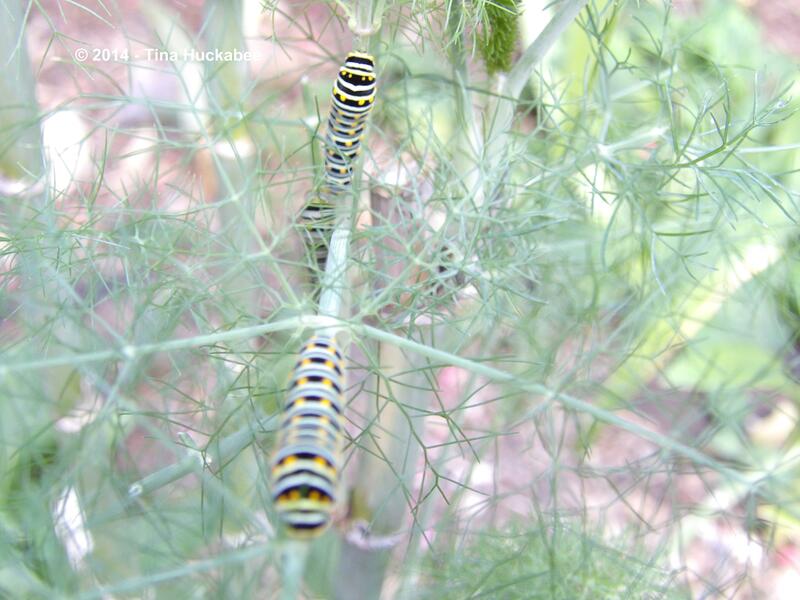 I’ve moved caterpillars in the past, when I didn’t think a plant could support the number, but this fennel is quite tall and did have lots of foliage. Obviously, not so now. 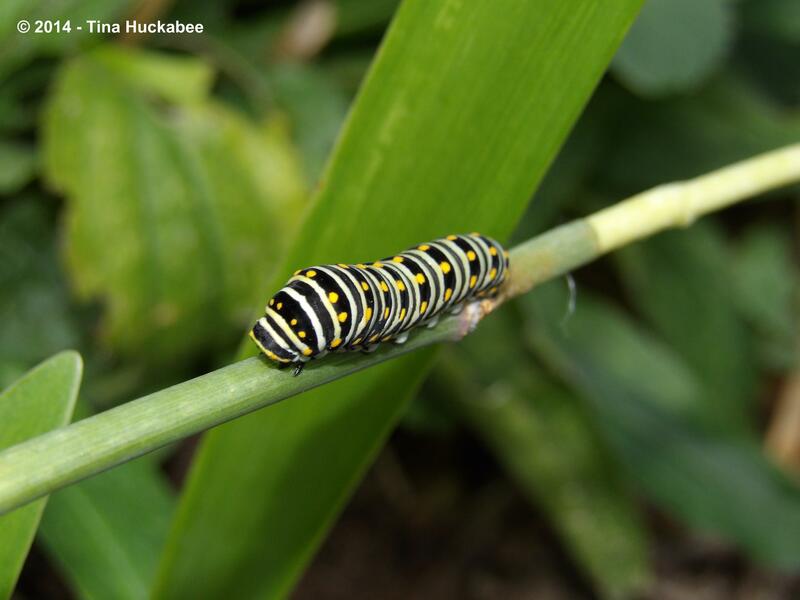 Sorry about your monarch cats, but you’re probably right, birds munched them–and better luck with the swallowtail. 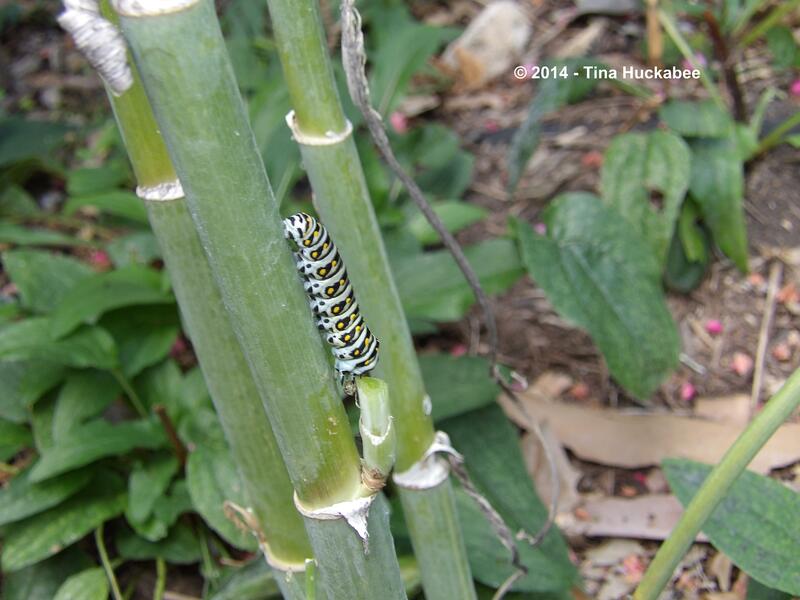 How wonderful to have Black Swallowtail caterpillars even if they do munch your fennel. I hope you get to see the butterflies and photograph them for us. Oh, I hope so too, Chloris. They’ll be emerging in the next 4-5 days, so I plan to keep an eye open for them!